Can't decide between a retro or modern bookshelf? Enjoy the best of both worlds thanks to the O2 Bookshelf from Moe's Home Collection. This extraordinary bookshelf boasts a look and feel all its own, guaranteeing it will complement d�cor in both contemporary and traditional settings. Also, the bookshelf consists of long-lasting sheesham wood and MDF and offers ample storage space for books, DVDs and much more. Pick up a deluxe bookshelf that is constructed to last with the O2 Bookshelf. 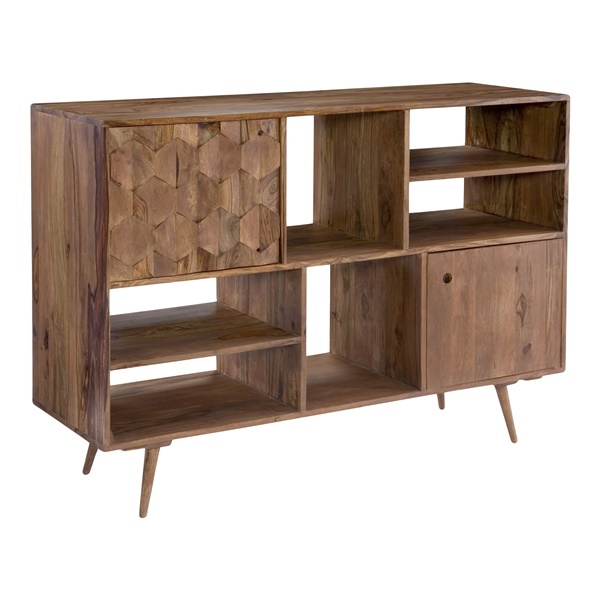 One-of-a-kind design ensures the bookshelf can serve as a storage unit and a decorative piece. Consists of solid sheesham and MDF, delivering amazing quality. Offers a timeless look and feel, making it a great addition in any modern or retro setting. Provides plenty of storage space, enabling you to store books, DVDs and much more however you choose.